Robert had a little bit harder than normal time falling asleep last night. I don't know if it was because we played "chase the ball" a little longer than we have been and he was wound up or if it was because he had eaten about a teaspoon of his birthday ice cream (that he has been working on since then 10th every few days and will last him until he's 18 months old at this rate... we're talking just a little cup of ice cream from Coldstone). But, regardless of the reason, he finally went down about 11-11:15 (about an hour and a half later than normal). Geof and I were both pleasantly surprised this morning when we woke up at about 8 and saw each other!! HE SLEPT THROUGH THE NIGHT, FOLKS!!! HE'S STILL SLEEPING!!! Robert has figured out how to move things and use them as step stools. Whether it's his fun bulldozer from the neighbors or the blanket and pillows off the couch, if he can get it to stand still, he'll use it to get up on the couch or chair. He's walking a lot more, too... and falling just as much =) Another good reason for all the padding in a cloth diaper, no? He and I were playing a great game of push/chase the ball earlier today. He loved it when the ball got bounced off his head! And... his spoon (now named Scoop) and its many identical siblings are still always in-hand. Robert has been sleeping/eating/walking/nursing/crawling/diaper-changing with this same plastic spoon in his hand since about 10 am. It's now 5:45. He dropped it once for 2 seconds and immediately picked it back up. I pried it out of his hot little hand to show him he could carry it in the basket he's been occasionally walking with today. As soon as I put it in the basket, he took it out and held on to it again. This turning one thing has been a big deal for Robert! 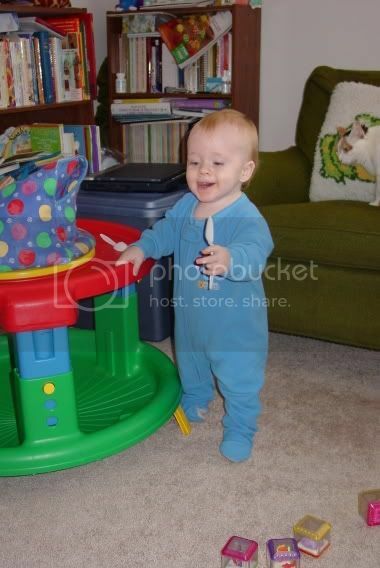 On the 15th he started walking well (he had just taken his first step on the 10th, now he walks all over his play area in the house - 10 steps or so at a time and back and forth all. day. long.). Robert also said his first word the other day (15th again). By first word, he has said many words before... but this is the first word that he says continuously whenever he looks at the same thing and repeats it clearly when you say it first. Here are the photos from Robert's birthday. Robert had his 12 month photos taken today at Sears. Here's a link to the session if you'd like to see them. At 6:35 today, we were sitting at Saturn for an oil change. I looked at Geof and said, "I was pushing right now." At around 8:00, I looked at him and said, "Still pushing." ... keep drawing me back to the memories of Robert's birth and the following couple days in the hospital. Robert likes Jerk. Like, the really spicy Jamaican rub, Jerk. Geof loves the stuff, and I can tolerate it in really small amounts. We had Jerk chicken last night for dinner, and while I thought mine had way too much of the rub on it (and I scraped a lot of it off and put it on Geof's) - Geof was letting Robert lick bits of it off his finger. Robert ate so much of my chicken yesterday, I couldn't believe it! Thankfully it didn't aggravate his diaper rash (that's slowly going away with lots of prefolds, zinc oxide, and diaper changes... I think we gave him too much tomato over a few days in a row). Today he had a little bit of my French toast (wasn't too thrilled, but it also wasn't the best batch I've ever made), some of my split pea soup, and bits of my dinner (Italian "schnitzel" with saut�ed marinated artichoke hearts and garlic bread) - as well as his baby food whole grain cereal with blueberries and pears and other puffs and wagon wheels throughout the day. Can you believe our little boy is 1 year old, now? In fact, by my computer's clock, he's been that way for about 15 minutes. I remember that day like it was yesterday; now, he's just about walking around.